UNC players celebrate during the showcase game. Photo by Hugo Sowder. Shocking upsets. Nail-biting comebacks. Showdowns between deep teams so talented that getting to witness the game is a privilege. March Madness, you say? Nah, this weekend was all about the Northwest Challenge. None of the division’s top four teams made the first place bracket, including the previously undefeated UC San Diego and the two-time defending national champion Dartmouth. We watched depth and throwing skill outlast the spectacle of POTY contenders dueling to own airspace above the end zone. Through it all, Ohio State Fever burned with a focus and ferocity that no team could contain. They won 15-11 in the tournament final against British Columbia and rose to #1 in the Ultiworld Power Rankings and #3 in the USAU rankings. #1 Ohio State Fever bested #4 British Columbia 15-11 in the Northwest Challenge final, a long-awaited sequel to their 2014 tournament win in Seattle, which served as prologue to the program’s only College Championship title. Ohio State’s performance in this year’s NWC title game was a final draft of a story they spent the whole tournament writing: big hucks, high-pressure defense, and disciplined cutting. Ohio State broke to open the game, but British Columbia broke back at 2-1 after the Thunderbirds’ Sam Roche was stalled, only to set the mark and get a decisive handblock. Ohio State dialed up the pressure on UBC’s handlers to limit their quick movement, and they stalled their opposition again on the next point. The pressure earned Fever two more breaks before the combined score even reached double digits. It’s easy to report on how dominant Sadie Jezierski was on the game’s bottom line: she racked up what she guesses to be “6 or 7 goals, assisted like 3?” in the final. It’s harder to report on how dominant her presence was on the field in the final. You could feel your heartbeat quicken when she got the disc in her hands. When she strode deep and the disc went up, the whole tournament knew what would happen. It felt inevitable, like Thor was calling his hammer home, if his hammer were plastic and Thor was a college-aged baller. Jezierski got to look this good in the endzone because her teammates were firing on all cylinders. Annelise Peters, Stephany Stumphauzer, and Kristen Behrens kept an iron grip on Fever’s backfield, and Ohio State’s downfield entered and exited cutting lanes with discipline. Fever’s utter fearlessness to shoot deep and trust their receivers also meant most of their offensive points finished quickly. The British Columbia Thunderbirds refused to give the game to Ohio State, even at 9-4. After all, they had just advanced from a semifinal game where they were down 11-7 to UNC and yet won 13-11. UBC has perhaps the best top-to-bottom skill on their roster of any team in the division, and that depth combined with their speed make them seem inexhaustible. Denise Su, rookie Ada Chang, Delaney Ignatieff, and Doris Zeng stood out this weekend as key parts of the Thunderbirds offense; that they could play as well as long-time stars Au-Yeung and Morcilla speaks to the roster’s capability. After a long point at 10-6, UBC threw out a fresh seven players who weren’t even a second string line. They were just seven more equally skilled athletes. This team isn’t tall, however, and only Naomi Morcilla could fluster Jezierski in the deep space. Ohio State was able to hold quickly in the second half by continuing to shoot, even after UBC flattened their marks. After the marathon seventeenth point, the teams traded holds until Ohio State’s fatal shot from Cara Sieber to Jezierski, who was waiting and ready in the end zone. #2 North Carolina Pleiades were easily the most fun team to watch at Northwest Challenge, and only a wild break run from UBC kept them from meeting their East Coast friends in the final. Outside of that semifinal, they were the next most dominant team in Seattle with statement wins over Stanford, Dartmouth, and UC San Diego. UNC and UBC made for an ideal semifinal match as two fast teams who can’t be shut down by focusing on only one or two stars; UNC will surely be hungry for a rematch. North Carolina’s cutters burned the rubber of the turf fields as they cut, while their handlers worked the disc with confidence and ease. 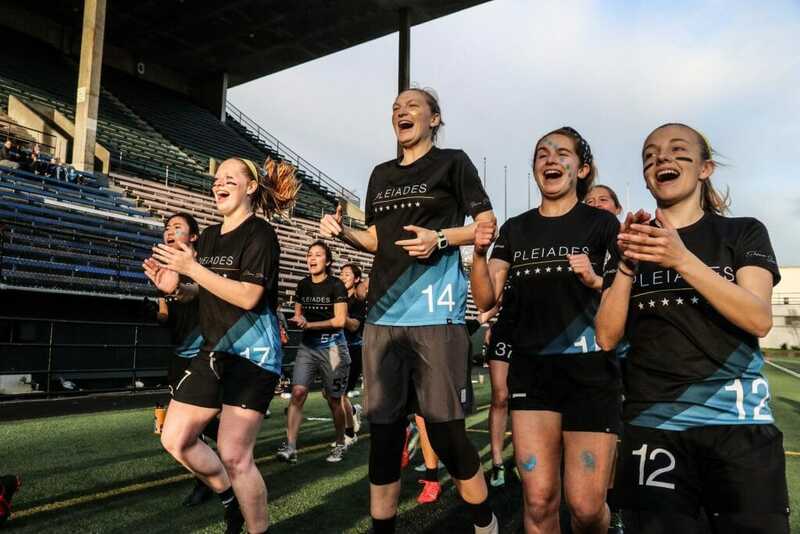 Pleiades were rarely flustered, and the whole team was so dialed in that you could expect a huge play or bid from any of their top seven players. The crowds loved Rebecca Fagan after her highlight play was released last week, but Ella Juengst, Bridget Mizener, Anne Worth, and Mary Rippe could also be counted on to make jaw-dropping plays during games. How does a team stop a team’s seventh best player when they already have top defenders on players one through six? On both coasts, North Carolina has proved they’re the toughest full team an opponent could draw, and they’re already becoming crowd favorite for big plays. Everyone expected to see these teams in the tournament final, but instead UC San Diego battled Western Washington for fifth place, and Dartmouth played out the eleventh place bracket. While these placements were due in part to some bracket shuffling to avoid in-tournament rematches, nobody expected these powerhouses to be the teams being shuffled. The #3 UC San Diego Psychos played British Columbia closely for the first half of the weekend, but the Thunderbirds surged ahead in the second half of the game with a string of breaks. UC San Diego seemed unable to regain control of the game, a control they’ve had in every other game before Northwest Challenge. They never got a grip on their showcase game against North Carolina, who took a near immediate 3-0 lead to set the game’s pace. The Psychos still ran their offensive system, but they didn’t look deep as often, and Alexandra Diaz stepped into the role of highest threat cutter all weekend. The Psychos were notably without their POTY frontrunner Dena Elimelech, who was traveling for the weekend, but it’s hard to say whether their three losses came from her absence or simply from the fact UCSD was playing East Coast teams for the first time this season. They’re still the favorite to take the Southwest title, but this weekend absolutely acted as the feedback session the UCSD coaches hoped for. #8 Dartmouth Princess Layout has come to Northwest Challenge and lost games before, as they play open lines and get their bench more reps ahead of the postseason. None of those losses mattered once Dartmouth reached Regionals. This year, however, their 1-5 record feels like an omen. Dartmouth wasn’t resting their starting line; players like Caitlyn Lee, Jack Verzuh, and Caroline Tornquist played heavy minutes, and they played hard. Dartmouth lost their first game 15-11 to Carleton Syzygy. The game was close throughout the first half, but Carleton went on a three break run out of half to build a 12-8 lead. Dartmouth set a zone on Carleton to slow their pace, but they couldn’t easily convert with big plays or bigger throws like they did last year. They worked their cutting lanes, and only when the stall count crept up toward double digits would Lee look up to see Verzuh jogging deep, hand aloft and waiting. This strategy wasn’t as foolproof for Dartmouth this weekend as it was for Ohio State, and they’d go on to lose the game 15-11. After that first game, more losses followed: one blowout to UNC (15-8) and a double game point loss to Washington. Dartmouth’s only win on the weekend was over Whitman in the eleventh place bracket. Dartmouth played like a Top 10 team this weekend, but they didn’t play like national semifinalist contenders. Like UC San Diego, Dartmouth was also missing a major contributor in Claire Trop, who was at the tournament but sidelined with injury. She’s expected to return for the postseason. Dartmouth will need her. #5 Carleton Syzygy’s Northwest Challenge performance landed them just outside the division’s top four in USAU’s final rankings, and that’s the perfect spot for this young team with so much talent and potential, who can play buttery offense like national champions on one point and then play crowded, open side-only offense on another. With a few postseason tweaks, however, this Syzygy roster has what it takes to be a semifinalist. Carleton won their first game of the weekend handily against BYU, but they faltered against Western Washington Chaos. Carleton had utter control for most the game, until late; when they were up 11-4, they let Western get a series of four breaks to close the margin. Western Washington set a zone that effectively slowed Carleton’s pace and gave Chaos chances to convert before Syzygy closed out the game 15-11. They’d go on to win over Dartmouth and Washington, but their switchy defense (and the many blocks from Nariah Sims) couldn’t contain the tournament’s other top teams. Syzygy added Isabel Arevalo, Maya Powell, and Anika Thomas-Toth back to their roster this weekend after all three players returned from abroad, and Arevalo’s impact in particular was notable in Syzygy’s offense. Arevalo’s speed and decisive play carve open lanes for her on the field, and her play style matches well with more aggressive players like rookies Carly Campana and Lauren Carothers-Liske. The scariest thing about this team is its potential. Carleton could be lightyears better by Nationals, and by next year, when they’ve only graduated three seniors? They could be the next divisional dynasty. If #20 Washingon Element can somehow overcome their mental block around Oregon Fugue, they have the tools to beat the Ducks at Regionals. Element will have to find an answer to Ella Hansen’s throws, but they look better than they have in years. #13 Stanford Superfly struggled against North Carolina, but they otherwise delivered an excellent weekend, despite missing Sarah Kratzer and Marie Payne to injury and Aminata Kalokoh, who’s abroad. Superfly has a phalanx of multi-talented cutters, and Hallie Dunham still rules the backfield. They’ll be threatening in an already stacked region. #15 Pittsburgh Danger showed flashes of glory this weekend, particularly from Abigail Bomberger, Lakshmi Ilongo, and Beth Manturuk. But Danger will have to tighten the laces in their offensive flow in order to be more dangerous in the postseason. #7 Western Washington Chaos yet again has some of the most talented players in the region, but they can’t seem to find a system to highlight the talents of players like Eleanor Joselyn, Riley Tauer, and Maddie Gilbert. They’re a top contender for the Northwest’s third bid, however, and they have the work-hard person defense to challenge Oregon and Washington. Comments on "Northwest Challenge 2019: Tournament Recap (Women’s)"